As many of you know Secrist Dolls is one of the last major doll manufacturers to still produce vinyl dolls right here in the United states. This is why our vinyl quality and doll designs are rated as some of the best in the world of dolls. 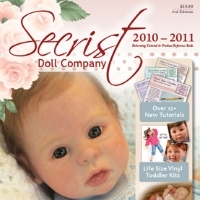 Now Secrist has done it again by introducing a new line of lens quality polymer eyes made in our own American doll factory. We are the only American doll factory that can make that claim! And because Secrist Newborn eyes are made in America by Americans we are able to offer you the most incredibly realistic newborn eyes ever seen. When you reborn or newborn a vinyl doll you will put a lot of detailed effort into your creation. Why? Because the little details that you add to your baby will make a big difference to your customers. The finer the detail, the more beautiful the doll. This is also true of the eyes that you use. Secrist Newborn Eyes have the tiny little details in the iris that you would expect to see in a real newborn. You can see the twinkle in the baby's eye even with this dark iris. That's because there are very faint hints of color through out making the Secrist Newborn Eyes come to life in a way seldom see in doll eyes. 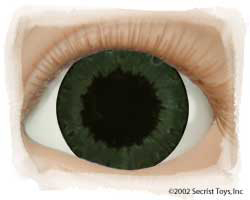 Lastly, Secrist Newborn Eyes have an actual glass-like lens over the iris of each eye to magnify the light coming in to the pupil, just like a real newborn baby's. Secrist Newborn Eyes have the beauty of glass but the strength of polymer. That's because they are made of the same optical grade polymer that eyeglasse lenses are made from. This elegant material reflects the glossy highlights and clarity of glass without the fragile disadvantages. You can actually see the magnified light reflect in the eyes just as you would with a newborn.